Pro-Assad 'Army' Wages Cyberwar In Syria The Internet has become another battleground as the Syrian government expands its crackdown on opponents. Sophisticated Web surveillance of activists has led to numerous arrests. 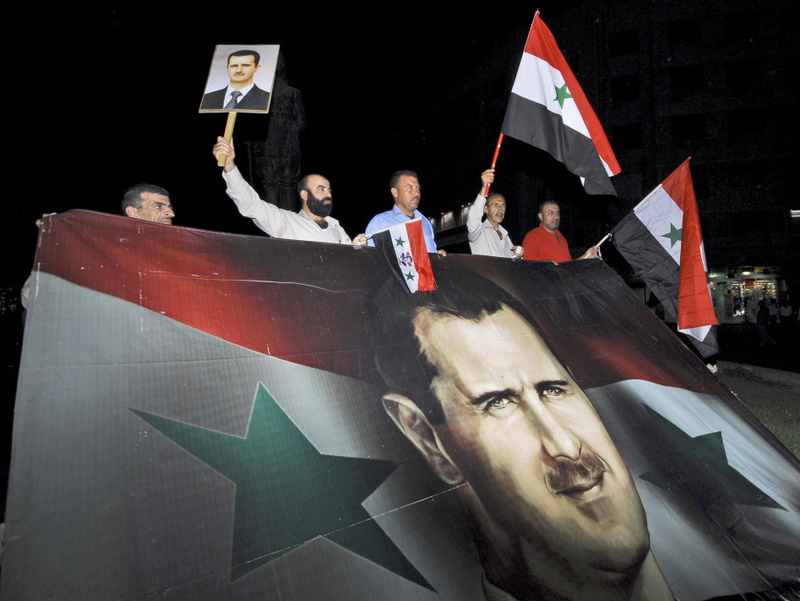 Supporters of Syrian President Bashar Assad carry a giant flag with his image on it during a pro-regime protest in Damascus, Syria, in August. Pro-government forces are now taking their message to a new arena: cyberspace. Struggling to put down a rebellion now in its seventh month, the Syrian government has turned the Internet into another battleground. Sophisticated Web surveillance of the anti-government movement has led to arrests, while pro-government hackers use the Internet to attack activists and their cause. It appears to be part of a coordinated campaign by the embattled government. Syria's leadership insists there is no uprising in the country. Syria's official news media reports that the unrest is a fabrication, part of an international plot. A recent documentary on Addounia, a private channel owned by the president's cousin, outlined the "plot" with satellite photos said to show sites where replicas of Syria's cities have been built. There, Americans, French and Israelis direct actors in protest videos. For those who don't quite believe the heavy-handed propaganda campaign, a cadre of young, tech-savvy Syrians is waging a more sophisticated pro-regime effort, flooding Facebook, news sites and Web pages. I've really never seen anything like this before, like the Syrian Electronic Army, which just seems to have so many members. I think it's really just their level of persistence and their level of activity that sets them apart. They call themselves the Syrian Electronic Army, conducting the most intense cyberwarfare in the Arab world, says Jillian York, with the San Francisco-based Electronic Frontier Foundation. "I've really never seen anything like this before, like the Syrian Electronic Army, which just seems to have so many members," she says. "I think it's really just their level of persistence and their level of activity that sets them apart." Are they a part of the regime? That is uncertain, says York, although Syrian President Bashar Assad saluted the youth of the Electronic Army in a June speech when they first emerged. "So it may be that they are supported by the government; it may be that they are independent pro-government forces," York says. Either way, the group has created a stir. It has hacked hundreds of Web sites to refute reports that Syria's uprising is a demand for political freedom. The sites that have been hit include those belonging to the U.S. Department of Treasury, actor Brad Pitt, television personality Oprah Winfrey and Newsweek's Facebook page. The hackers blame terrorists for the violence, a message that matches the government's line. Josh Landis, an American academic who writes an influential blog on Syria, says that Iran has helped Syria "immensely" with these efforts. He says that when the protests began, the government's response was to try to close the country to outside information, to control the message inside Syria, banning almost all international media. The Iranians, says Landis, counseled Syria to mount a more sophisticated international response. "You've got to train up a cadre of young, hep Syrians who can get on all these social media, and that's what they've tried to do," he says. At the end of the day, you will never know who is actually sitting behind that account and looking at that monitor. The security forces are using his account, are using his identity, to know about their moves. That's one of the main risks. When asked whether an attack on, say, Winfrey's site is effective or simply a nuisance, Landis characterizes it as "all 10 thumbs." "But to have young voices that are sympathetic to the regime and begin countering this message demonizing Syria, if the Syrians don't do it, if the regime doesn't do it, they are going to lose even their own supporters," he says, "because the message is just going to be so one-sided." The Electronic Army counters the protesters' demand for change with a message of fear, Landis says.
" 'This is a religious war, this is a sectarian war, they are going to kill the Christians.' They try to scare a wider umbrella of people," he says. For months, young activists had the upper hand on the Web, organizing online, evading a security service that could do little more than monitor cell phone calls. Now, it appears the regime is catching up, as demonstrated by the hacking skills of the Syrian Electronic Army. When the Internet pressure group Anonymous took up the cause of Syria's anti-government protesters by hacking Syria's defense ministry website, the Electronic Army retaliated by defacing an Anonymous site. "It's definitely become much more serious," says activist Alexander Page, the alias he uses online. "I think that people have to understand that. People have to see that the Syrian Electronic Army is capable of getting a hold of activists through what they are doing." The Internet has become almost as dangerous as protesting on the street, says activist Amr Sadek. After arrest, he says, activists are forced to stay online for intelligence gathering by the Syrian Security Service. "At the end of the day, you will never know who is actually sitting behind that account and looking at that monitor. The security forces are using his account, are using his identity, to know about their moves. That's one of the main risks," he says. The relentless arrests, compromised protest plans and activists identified from secure lists on Facebook are all signs of the success of this new campaign.